» Fully Solid State Design - no moving parts - no wear and tear - no noise - consequently long life. » Uses the latest micro-controller chip for control functions. » Uses one main circuit board for easy maintenance. easily reproduced for identical results. » Connected drive is automatically recognized & indicated by means of LED on the torque controller. automatically selected for the connected drive, hence drives can not be abused or overused. » Manual reverse by push button, in case of emergency. » Drive Speed adjustable in reverse rotation. » Hand (trigger) mode or foot switch mode, both are available. » Expansions can be carried out either in single cycle mode or auto repeat mode. » MCB has been provided to protect the drives against over current by short circuits..
» Plug in type PCBs reduce down time to minimum during trouble shooting. » LED indicators provided for forward, reverse & trip conditions of drive. than triacs. This leads to greater reliability & the power circuit becomes almost failsafe. » All the spares inside the panel viz : PCBs, Transformers, CT, Relays DPM etc. Can be replaced by use of only a screw driver. 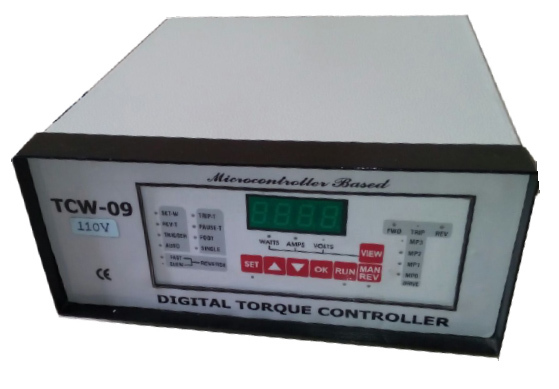 Note : Voltage Stabilizers for use with TCW torque controllers. All TCW torque controllers are supplied with operation manuals.